Miami, FL- The end of 2018 Beach Road Trip (BRT) Weekend Tour will take place November 1-4 on the Historic Virginia Key Beach in Miami, Florida. The headliners for the weekend include: Soca Monarch Machel Montano; dancehall artist, Alkaline; and a host of internationally known DJs. 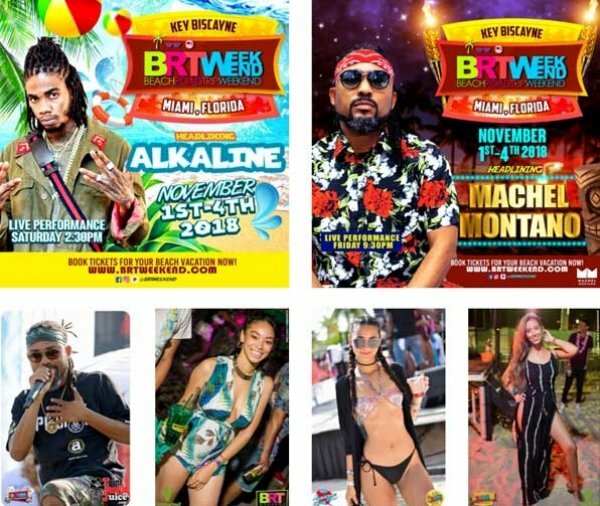 The 4-day, all-inclusive weekend will launch with a Yacht Party on Thursday (November 1); a Welcome Check-In Party and The V Maui Wowi on Friday (November 2); the Xtreme Wet N’ Wild Party with a performance by Machel Montano and the BRT Glow Eruption on Saturday. The final day Sunday will close with the J’ouvert Breakfast Party and the BRT All White “Grand Finale”. For those who want to keep the fun going well into the morning hours, there will be after parties held every night at various Miami venues. After rolling out BRT Weekend in three (3) different locations—(Dominican Republic, Atlantic City, and Los Angeles— organizer, Hans Mullings, is expecting the Miami event to be the largest BRT Weekend in history. VP Records, Pandora, TaxUSA, and a host of media companies have confirmed their support for the weekend’s activities. There will be celebrity hosts and endless giveaways at all parties. BRT Weekend attracts thousands of partygoers in various destinations with its 4-day excursion. Since its inception 7 years ago, BRT Weekend has evolved from an annual event in the Florida Keys to multiple locations within the US and islands in the Caribbean—making it the first Caribbean-party as a tour. To date, the tour has showcased entertainers such as Popcaan, Charly Black, Ding Dong Ravers, Ultimate Rejects MX Prime, Konshens and Bunji Garlin. Locations have included the Florida Keys, West Palm, Dominican Republic, Atlantic City, Los Angles, Palm Springs, and just added, Turk and Caicos.